Let's Do It for ME! : The Big Sleep for M.E. has arrived! The Big Sleep for M.E. has arrived! The Big Sleep for M.E. has arrived - so start plumping those pillows now! The Big Sleep for M.E. was Julia Cottam’s idea to create a fun, easy and inclusive event to raise awareness and money for the UK Centre of Excellence for ME that would coincide with ME Awareness Week. The event is extremely flexible. All you need to do is lie back, make yourself comfortable, and if you really want to - sleep; a sort of mass sleepathon. Anyone, anywhere can take part. You can take part for just a day or the whole week if you like. 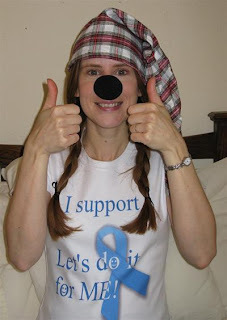 Why not wear some silly sleepwear or an outrageous nightcap, as Julia’s proudly modeling, to make it even more fun! Anything goes - from your everyday comfy PJs to something more ridiculous. It's entirely up to you. And because this event is about fundraising and awareness you can do either or both. There are even group fundraising pages set up to make it even easier. The Big Sleep for M.E. was thought up to take into account the fact that the illness restricts many sufferers to spending a lot of time lying down and in bed - some are totally bedbound; with the idea to turn this into something positive for our cause. The wonderful thing about this event is that for those ‘willing wellies’, healthy supporters, out there you’ve never had a better excuse to put your feet up and have a lie down knowing it’s all for a good cause! Those that are bedbound through this illness can also join in the fun for a change! 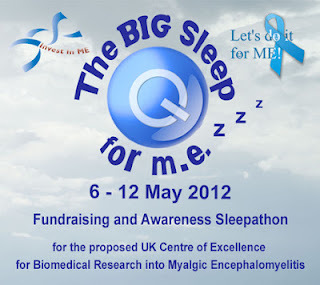 http://www.justgiving.com/thebigsleepforme with more taking part for just awareness. There have also been some unexpected and delightful deviations to the event with pets now joining up. 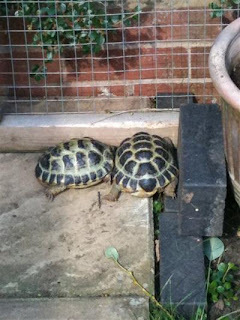 Bubble and Squeak, two eighteen year old cats, have their own fundraising page http://www.justgiving.com/Squeak-and-Bubble-Cats, and the tortoises Hector and Hamish are helping out Ruth Gilchrist on her page http://www.justgiving.com/Ruth-Gilchrist. Kaiser Bill and Thomas are now team members of The Big Sleep for ME group fundraising page http://www.justgiving.com/thebigsleepforme. Kaiser Bill being the feline representative and Thomas the canine; although if they actually met in up in real life there could be some diplomatic differences. There are also sleepover parties taking place in aid of The Big Sleep. As you can see there are so many ways to join in. And the wonderful thing about this event is that healthy supporters and sufferers can all come together to do something positive for M.E. So far there are people from all over the UK, America, Italy and Sweden that have signed up. If you’re interested to find out more go to the website www.thebigsleepforme.com or visit the Facebook page www.facebook/TheBigSleepforME, or email thebigsleepforme@btinternet.com. If you’re unable to take part but would like to show your support you can give a donation either by going to the JustGiving pages mentioned or by texting BSME99 to 70070 with the amount you would like to give (for example BSME99 £5 to 70070). With thanks to Julia for all her hard work developing and launching this inclusive and positive venture and to everyone taking part. 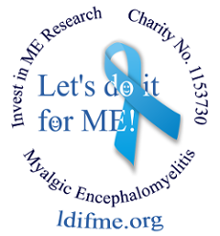 We can all make a difference to M.E! ME Awareness Month - no wait - come back!